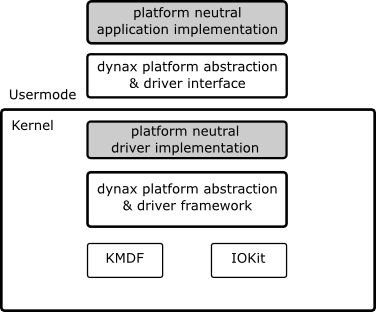 The dynax driver framework provides common C++ driver and device classes to ease kernel driver development as well as driver interface integration in user mode applications. The framework is based on interface implementations for KMDF (Windows), IOKit (OSX) and Linux (planned). device classes for USB, PCI, FW, etc. destruction always succeeds: a destructor never throws an exception. all object parameters are reasonably checked (ofcourse pointer validity can not be ensured without overhead, so its only checked against null pointer. it is always valid to directly forward an dx/dxd object as a parameter to another dx/dxd object. Validity is ensured. Object construction might fail with exception. Object construction might fail with object status. Always check object status! The framework is lightweight. It precisely executes only the needed kernel KPI. If drivers are slow than due to a bad design and its inherent workarounds. dxd provides the means to help with a clean design, with less pitfalls. dxd takes care about tedious and error prone KPI requirements and therefor avoids the implementation of slow workarounds due to KPI misinterpretation and OS bugs. The dynax driver framework uses a subset of C++ without real exception handling and RTTI runtime type information. However dxd does provide some kind of exception handling semantics based on macros. This way you can get at least most of the error handling out of the way of the drivers program flow. There is a rather religious discussion about C++ and kernel development. You can loose your time and join the discussion or just get your driver done - probably faster in C++, better structured and platform independent with the support of dxd. dxd classes do provide a way around most kernel pitfalls. Its uncompromised object orientated design helps keeping your code safe, fast, small, nice and clean. you may spent the extra spare time and do something useful.